Fuel costs consumed 3.23 % of the average South African pay cheque. The highest proportion of any country surveyed by Bloomberg in 2017. Combined with ongoing electricity price hikes, among others, all contributes to an ever increasing cost of living and seemingly endless upward spiral of inflationary pressures and declining lifestyle. This situation has many wondering where to turn. The fuel price is determined by international supply and demand and the prevailing exchange rate, neither factor being within the control of the South African consumer. Many South Africans have moved to diesel to reduce their monthly fuel spend. 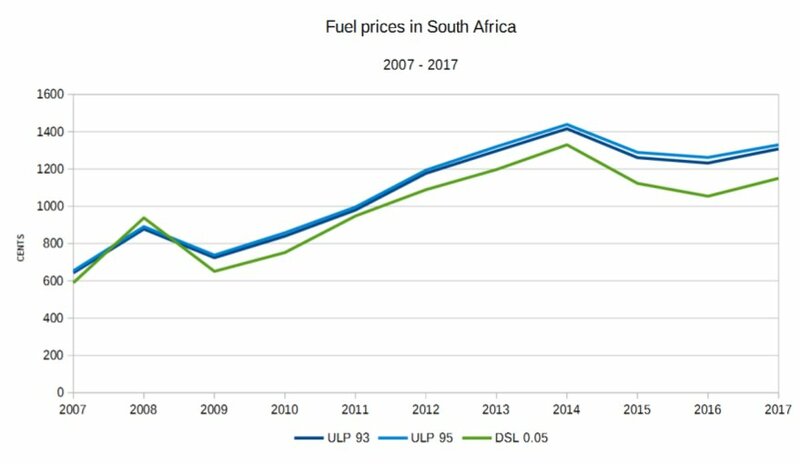 While diesel is somewhat cheaper than petrol in South Africa, the difference in cost is only about 10 % (based on the February 2018 official price), and historically has even been more expensive that petrol (for example in 2008). Fortunately there is an alternative for owners of diesel engines: Biodiesel. Biodiesel offers considerable costs savings over tradition diesel, as well as other significant advantages- including being a more environmentally friendly energy source. To learn more about the potentially massive savings you can make with biodiesel, contact us, because frankly you have more important things to do with your money than spend it getting from A to B.